As an alternative to current bone grafting strategies, a poly-lactide-co-glycolide/calcium phosphate composite microsphere-based scaffold has been synthesized by the direct formation of calcium phosphate within forming microspheres. It was hypothesized that the synthesis of low crystalline calcium phosphate within forming microspheres would provide a site-specific delivery of calcium ions to enhance calcium phosphate reprecipitation onto the scaffold. Both polymeric and composite scaffolds were incubated in simulated body fluid (SBF) for 8 weeks, during which time polymer molecular weight, scaffold mass, calcium ion concentration of SBF, pH of SBF, and calcium phosphate reprecipitation was monitored. Results showed a 20% decrease in polymeric scaffold molecular weight compared to 11–14% decrease for composite scaffolds over 8 weeks. Composite scaffold mass and SBF pH decreased for the first 2 weeks but began increasing after 2 weeks and continued to do so up to 8 weeks, suggesting interplay between pH changes and calcium phosphate dissolution/reprecipitation. 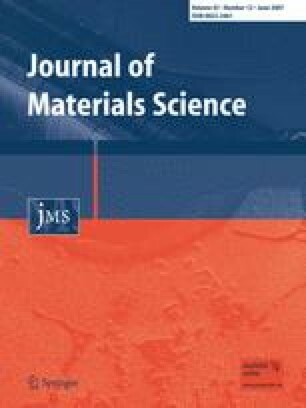 Free calcium ion concentration of SBF containing composite scaffolds increased 20–40% over control values within 4 h of incubation but then dropped as low as 40% below control values, suggesting an initial burst release of calcium ions followed by a reprecipitation onto the scaffold surface. Scanning electron micrographs confirm calcium phosphate reprecipitation on the scaffold surface after only 3 days of incubation. Results suggest the composite scaffold is capable of initiating calcium phosphate reprecipitation which may aid in bone/implant integration. This work was funded by The National Science Foundation (BES-0201923). The authors would also like to thank Swaminathan Sethuraman, Ph.D. for his assistance with scanning electron microscopy.